1 of 4 Heat oven to 450 degrees F. Remove giblets from cavity of chicken and discard. Rinse cavity and exterior of chicken; pat dry. Stuff cavity of chicken with the onion, carrot, lemon and 4 of the sage leaves. 2 of 4 Gently lift breast skin; season meat with some of the salt, pepper and poultry seasoning. Tuck remaining sage under the skin. Season exterior with remaining salt and pepper. Prepare chicken for roasting. 3 of 4 Place chicken on a rack in a large roasting pan. Roast at 450 degrees F for about 1 hour and 30 minutes or until internal temperature of the thigh reaches 180 degrees F on an instant-read thermometer. Remove chicken from roasting pan; tent with foil. 4 of 4 Drain all but 2 tablespoons of the fat from roasting pan. Place over medium heat and add wine. Cook for 1 minute, scraping up any browned bits from bottom of pan. Sprinkle flour into pan and cook for 1 minute, continuing to scrape bottom of pan. Gradually whisk in broth. Bring to a boil. Lower heat and simmer 2 minutes, whisking constantly. Strain into saucepan and add parsley. 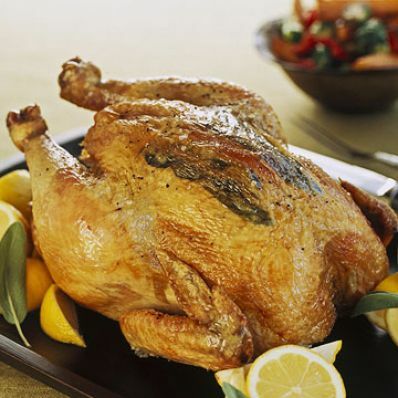 Carve chicken; serve with warm gravy. Per Serving: 802 mg sodium, 523 kcal cal., 8 g sat. fat, 1 g fiber, 51 g pro., 8 g carb., 29 g Fat, total, 199 mg chol.